We have heard from a number of people the last few years that one area we had to see was Sedona, AZ. As you have seen in the last few entries, there are lots of interesting things to do. Sedona is a town located in the middle of a relatively small canyon known as Red Rock. The mountains rise all around the town and indeed the town is growing up on the slopes. 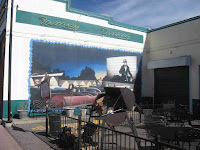 This is another AZ location that has attracted the artist community and has made itself not only a highly desirable (and expensive) place to live but also has become a vacation destination. It should be noted that while we were there (spring break) traffic has also grown to the point of grid lock most of the time. I can imagine that I would enjoy living in some of the homes seen on the hill side with terrific views of the mountains, but the multi-million dollar price tags will force me to look elsewhere. We explored much of the mountain areas and enjoyed the colors, forms and lighting at various times of the day. 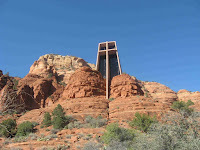 We visited the Chapel of the Holy Cross, which has a great location on the side of the mountain and can give inspiration to the hardest of hearts. Sedona itself is, I guess, a haven for the avid shopper of trinkets from the simple t-shirt to the most expensive of Object de Art. Anneke got the t-shirt for herself and one for Aleister, our Grandson. His is reddish brown and dyed with local dirt, and it says “Grandma and Grandpa went to Sedona & all I got was this DIRTY SHIRT ! In this group of photos, I have included my first self-portrait of the season taken close to sunset in a quiet and remote hill location with the help of my trusty camera self timer. The area around Camp Verde and Sedona, AZ has three national monuments that provide some small insight into the lives of the Sinagua people that inhabited the area as farmers and hunters in fixed villages from around 1000 AD to 1400 AD. They apparently prospered in this area with good weather, water, food and shelter. The mystery of these people is their complete disappearance around 1400 without a trace and without any indication of why they disappeared. These three national monuments at Montezuma Castle, Montezuma Well and Tuzigoot allow a small look into their lives. The Montezuma label is a complete misnomer that was applied by early explorers, who mistakenly thought these ruins were from Aztec settlers. The structures at Montezuma Castle and Tuzigoot display the skills of building impressive structures for the developmental skills for the period. The well is especially interesting since it has apparently been providing over 1.5 million gallons of water from underground sources every day from prehistory right up until today without faltering, providing a pool 55 feet deep at a constant temperature of 72 degrees year around. This water then flows out to the nearby Beaver Creek which also has water in it year around. Today modern settlers are continuing to move into the area for the same reasons as the Sinagua. I cannot help but wonder if these settlers will last as long as these earlier settlers. Jerome, AZ is another AZ mining town that grew to over 15000 in the early 1900’s mining copper and quickly fell in to bad times with as few as 50 residents. Like many other such towns, it has rediscovered itself as a tourist trap and haven to local artists. I can only wonder if any of these small southwest towns are not a haven for artists and the stuff they peddle. 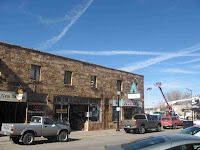 Jerome claims to be the best known of these old mining towns and who am I to question that. I only heard of it after arriving in the area. Never the less, it seems to be doing well, especially since we visited in the heart of the spring break season. The town sits high on Cleopatra hill with a wonderful view of the surrounding valley. As can be expected, it is currently filled with art galleries, restaurants and gift shops. Of special note is the fact that three of the prominent business that were there during the mining heyday are still remembered and honored in the town today That is to say- three Bordellos. 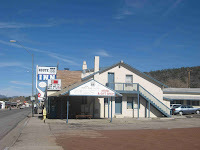 Based on a recommendation we received while visiting Williams, AZ we may have to return to try the haunted hamburger in one of the local restaurants of note. 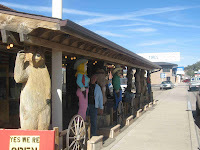 The items in the gift shops can be found in every town in the southwest. The historic train ride to the Grand Canyon is 65 miles and is run this time of year with a 50 plus year old diesel engine. In the summer, they use an over 100 year old steam locomotive. It takes a bit over two hours for the journey thru ranch lands, national forest and generally wild country. The car stewardess provides a good deal of the entertainment for the trip. Several wondering minstrels also pass thru the cars. The ride gives you an opportunity to perhaps experience what it may have been like to ride the rails in times gone by. The train ride terminates at the Grand Canyon Depot, which is the only log structure depot still being used, as such, in the United States. 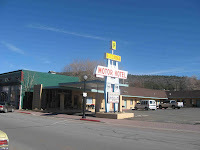 This is our second visit to the south rim of the canyon and we took in some of the sights close to the village and enjoyed lunch in the famous El Tovar Hotel. As in our first visit, the size and beauty of the canyon are truly breathtaking. As in our last visit, you get the desire to spend more time here to explore the canyon more fully, perhaps with a guided tour to the canyon floor and certainly a visit to the north rim when weather permits. The train ride back was less exciting then the trip up simply due to its repetitive nature. How easily bored we become. I guess the train line realized this and there was a bit of excitement near the end of the return trip when several train robbers on horseback appeared with guns blazing. 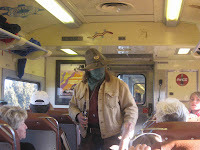 They boarded the train to “rob” the passengers who were interested to take part. We had several small children in our coach, who were a bit nervous and taking it more serious than intended. They were quickly hiding their recently purchased stuff animals to prevent them from being taken by the train villains. In the end, it was quite amusing and the kids really did enjoy the adventure. 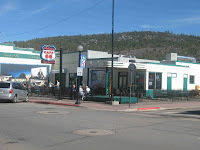 Williams, AZ is the jumping off point for many people who visit the south rim of the Grand Canyon. 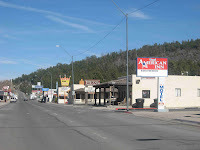 It is just off Interstate 40 and route 64 to the Canyon. 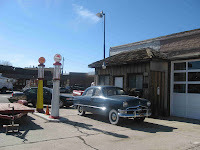 It is a town that prospers from this location and its history along Route 66, The Mother Road. Its particular claim to fame in this regard is the fact that it was the last town to be bypassed by the new interstate system. Or as they like to say here, it was the last stoplight between Los Angles and Chicago. 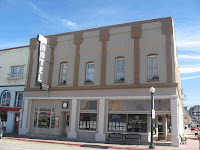 The town is filled with classic route 66 diners, motels and tourist shops. It is also the place to catch the Grand Canyon Train, the reason we are here. 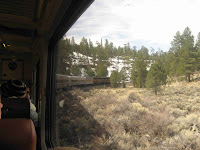 This is our second visit to the Grand Canyon and we wanted to take the train the last 65 miles. 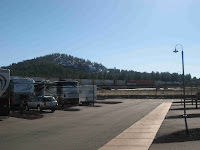 The Grand Canyon Railroad has also recently completed a new RV park for folks like us. It is very nice and in walking distant of downtown and the railroad station. 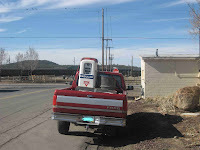 By necessity, it is also on top of the train tracks, we found out that it handles more than just the train to the canyon. 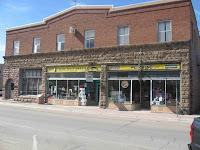 For a town that deals with transient customers, we found it very friendly and even quaint. 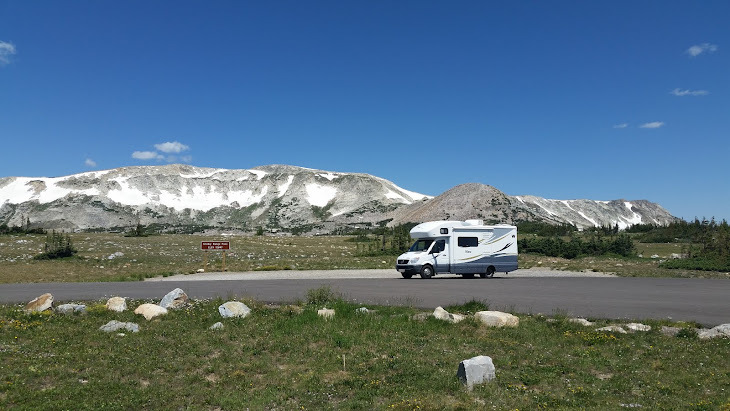 The surrounding area is high country range with rugged people and even more rugged roads. There is some concern over possible impact of fuel costs on tourism and we found one person who seemed to have his own solution to rising fuel prices along the road.